Since 1976, K&F Rollshutter Manufacturing has been bringing secure, energy-efficient rollshutters to dealers, homes, and business across Canada. Locally-owned and family-operated, our 7,500 sq. foot facility can manufacture custom rollshutters to any size, and our bonded technicians are experienced with building, installing, and servicing rollshutters for every purpose. Whether you’re looking for residential, storefront, or commercial rollshutters, we can handle any job. Building the best rollshutters starts with the best components. 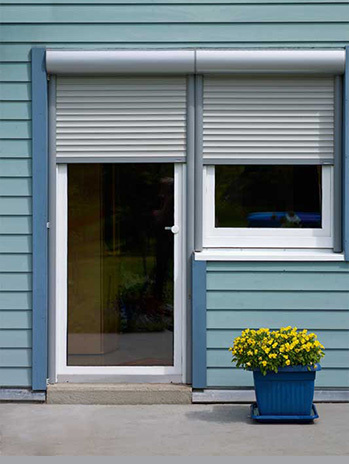 Our aluminum housing boxes and curtain slats with exterior-grade baked enamel finishes have all been engineered by Alulux of Germany, a leading name in the massive European rollshutter market. Combined with Somfy of France’s world class electric drives and Gaviota’s drive shaft axles and springs, our custom-fabricated rollshutters offer you superior light-control, utility savings, and security. In fact, we’re so sure of our rollshutters’ durability, we provide a full warranty and after-sales service on all parts and workmanship, with a one year complete warranty on systems we build and install. Exterior finishes and labour are backed by a 3-year full replacement warranty and all electric parts are covered by a 5-year warranty.